Missing from most of the Brett Kavanaugh narratives over the past two stormy weeks has been his tenure as a team player on Independent Council Ken Starr’s investigation of former President Bill Clinton. In his fiery statement in his own defense last Thursday, Kavanaugh suggested the motives for the all-out assault on his character by Senate Democrats and the Democrat Mainstream Media included “revenge on behalf of the Clintons”. “It was Kavanaugh who pushed Starr to ask Clinton, in graphic detail, about the nature of his sexual relationship with White House intern Monica Lewinsky,” according to an AP report as a blizzard of other, unconfirmed reports on the nominee’s beer-drinking and ice-throwing exploits flooded the media. Two reporters, one American and one British, wrote about the scandal and its outcome in a different light. The Starr investigation was seen as participating in a U.S. Government coverup of the mysterious circumstances surrounding the death of deputy White House Counsel Vince Foster which was officially ruled a suicide. Both are now reluctant to revisit the Foster story which Evans-Pritchard referred to as the “electric third rail” of American politics. While serving as the Sunday Telegraph’s Washington Bureau Chief, Ambrose Evans-Pritchard recounted how he “crossed swords with a younger Brett Kavanaugh in one of the weirdest and most disturbing episodes” of his career as a journalist. The “episode” Evans-Pritchard spoke of “has suddenly become a second front” in Kavanaugh’s nomination saga. Sen. Dianne Feinstein has accused Kavanaugh of violating secrecy laws by revealing the details of a federal grand jury. “Disclosing grand jury information is against the law,” she told Politico. She said it also showed he had misled the Senate by assuring categorically that he had never leaked grand jury material to journalists. Knowlton, who had been called to the grand jury because of a story in the Telegraph, “was a crime scene witness in the death of Vincent Foster, the White House aide and ex-law partner of Hillary Clinton. At the time this was a mystery case, a big story during my tenure as the Sunday Telegraph’s bureau chief in Washington,” Evans-Pritchard wrote. 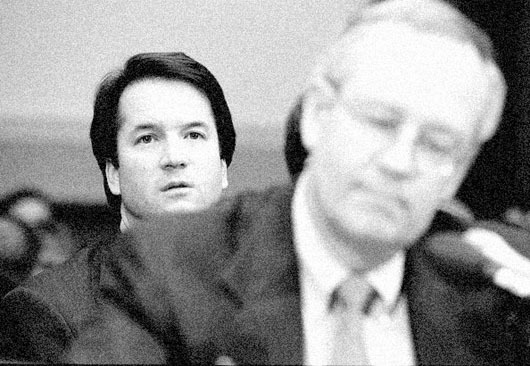 After the Telegraph story ran, the Starr investigation subpoenaed Knowlton to face questioning by Kavanaugh. Evans-Pritchard continued: “Veteran intelligence agents might recognize a method. It had the hallmarks of a boilerplate softening-up operation. In my view – unprovable – the objective was to frighten him before his grand jury appearance. It smacked of police state behaviour on the streets of Washington, D.C.
Kavanaugh went on to write the Starr Report on the Foster death. Knowlton, however, “got the last word, literally,” Evans-Pritchard wrote. “He filed a 511-page report at the U.S. Federal Court with evidence alleging a pattern of skullduggery,” and asked that it be attached to the Starr Report. The 20-page summary asserts that the FBI had “concealed the true facts,” that there had been witness tampering, and that the report had ignored facts that refuted its own conclusions. “There it sits in perpetuity, a strange rebuke for Mr. Kavanaugh by his own fellow judges on the federal bench,” Evans-Pritchard wrote. Contacted about the story, Ruddy, who authored “The Strange Death of Vincent Foster”, called it interesting. “It conflates different things here.” He said his interaction with Kavanaugh had been limited to phone calls.